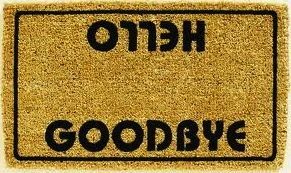 “There’s a little goodbye in ev’ry hello.” Now that’s a sobering thought. Who wants to think about “ending” just as we are “beginning” — a friendship, a love affair, a you-name-it relationship with a who or a what? And this happens to be one of the songs on my new ukulele CD “Smile, Smile, Smile.” The idea for this tune begins the day I learn that one of my mentors has died. First there is “the phone call.” Then the rush of emotions that follows when “goodbye” smacks you in the face. And the heart. And wouldn’t you know it, I also have a gig that day… “Happy Hour” at a fancy retirement home across town. Oh lovely. What I really want to do is crawl back into bed, pull the blanket over my head and wish the world away. Hanging out with slightly inebriated seniors and singing songs like “On the Sunny Side of the Street” is not my idea of happy. Well not today anyway. But this mentor, along with my other teachers, taught me to “be a pro.” To show up at the gig, no matter how I’m feeling. And on time. Prepared. Looking good. They drilled it into my bones and doing an ostrich dance is not an option. So I slap on the Maybelline, grab a colorful frock from the closet and go to work. In fact I arrive so early there’s extra time to hang out and that’s when I find Francesca. Or maybe she finds me… “How are you dear?” she asks, looking up from the big yellow granny square she is crocheting. I tell her the truth. That I am not okay and then I launch into my story. She lays the nest of yarn in her lap and listens, really listens. The quality of her attention is an act of kindness that resonates with me. Still. When I finally wear myself out, Francesca speaks. This ninety-three year old who has loved and lost and above all, is still here, turns into a Zen master, right before my eyes, and lays some wisdom on me that is akin to alchemy. I am transformed by her words. 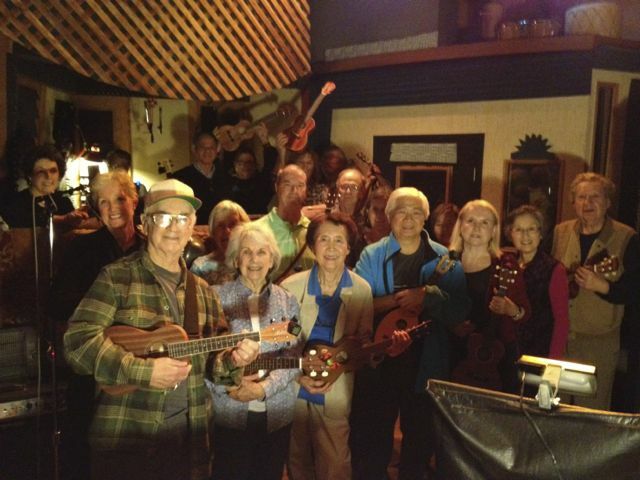 A first at Sunburst Recording… 19 Ukuleles! And I am determined to put these words into a song and that’s what “There’s A Little Goodbye in Ev’ry Hello” is all about. And what better way to explore hard human truth than to lay on a jaunty melody, lay off the sad minor chords and turn the whole thing into a sing-a-long. I need help from my friends. Enter The CC Strummers, my ukulele ohana. So one sunny Saturday in February, nineteen hearty grandmas and grandpas join me at Sunburst Recording to perform on my CD. In return I provide all-you-can eat pizza, promise to put their names and group picture inside the album and deliver their complimentary CD with a hug. During the session, I take a short video and you know what…it will make you smile. (Click here to watch). But you’ll have to listen to the whole song to find out what Francesca told me that day. The CD is coming soon!